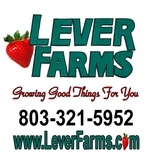 Lever Farms field trips introduce students to the importance of agriculture in our state. We make this learning experience fun and educational for students and teachers - in a 100 acre outdoor classroom. Lots of farm fun games and more! Minimum of 20 participants per field trip groupAfter registering, the coordinating teacher will receive a packet for pre- and post- field trip information and activities for the classroom. Fall Field Trips are by appointments Monday to Friday in October. Cost is $7 per person (including all students, chaperones/parents/siblings). Two teacher per 20 students are free of charge. Each person will receive a small pumpkin to take home.